Clothing dryers are a common appliance found in many households. According to the National Fire Protection Association, this household appliance caused more than 15,000 fires in US homes during 2010-2014 and more than $238 million in property damage. Dryer vent cleaning is a necessary maintenance procedure that many people are not aware of or don’t pay necessary attention to. A properly maintained dryer can help you save on electricity bills, prolong the appliance’s life circle and ensure healthy home environment. It is recommended to inspect and clean dryer vent at least once a year. 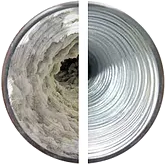 Our dryer vent cleaners are certified technicians who will use specifically designed equipment to inspect your dryer and apply effective cleaning methods to remove any lint, dirt or harmful substances and ensure that your dryer works properly and effectively. Creates a potential hazardous situation. Lint that clogs your dryer is extremely flammable and poses a serious fire hazard. Increases electricity bill. Dryers work by removing moisture with hot air, and if something prevents the air from escaping, it will take a dryer additional cycles to dry clothes. Clogged dryer vents can use up to 30 percent more energy. Poses danger of mold to your home environment. By removing moist, hot air, a clean and properly maintained dryer ensures that the moisture is expelled outdoors. If the moisture doesn’t escape properly, it can cause mold growth in your home. Cuts down your dryer’s life cycle. If your dryer vent is clogged, in addition to using more energy, it also cuts its life span by running longer. Clothes aren’t completely dry after a normal cycle. More lint than usual accumulates in the dryer’s lint trap. Call us today to schedule an appointment to ensure that your home is healthy and safe! © 2019 Total Home Care.